Amber received her B.Sc. in Chemistry with a Minor in Environmental Science from the University of Virginia in 2003 and then received her Ph.D. in Marine Science at the Virginia Institute of Marine Science, College of William and Mary in 2010. She was a Postdoctoral Associate at Brown University and started at the UT Marine Science Institute in 2012. 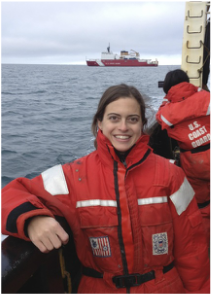 Amber is a marine biogeochemist who works in coastal ecosystems. She focuses on functional processes such as nutrient cycling and transformations of organic matter in marine ecosystems and applies biomarker and isotopic tools to understand these processes. Her research questions often try to unravel the impacts of human-induced and climatic changes on these processes. Her research sites have included shallow coastal bays in Maryland, Virginia, estuaries and rivers in Texas, a transect from the Providence River to the Rhode Island coastal shelf, and the Chukchi Sea and Beaufort Lagoon Ecosystem, along the northern coast of Alaska . Brian received his B.A. in Biology and Environmental Studies from Colby College, Maine in 2018. He joined the Hardison lab to work on the newly established Beaufort Lagoon Ecosystems LTER studying nutrient cycling at the sediment-water interface off the north coast of Alaska. He is also a member of the National Science Foundation Graduate Research Fellowship Program. Sarah received her B.S. in Marine and Freshwater Biology and B.A. in Plan II Honors from the University of Texas at Austin in 2015. 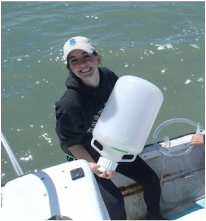 She studies the sources and compositional changes of estuarine organic matter in response to drought, periodic storm events, and Hurricane Harvey in the Mission-Aransas Estuary. Xin received her M.S. in Conservation Ecology from the University of Michigan in 2014, and B.Eng. in Environmental Engineering from Zhejiang University in 2012. She worked as a Research Assistant at Graham Sustainability Institute at the University of Michigan before joining the Hardison lab in 2015. 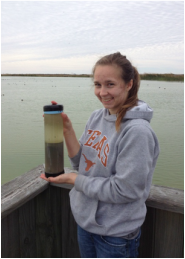 Her current research focuses on nitrogen cycling processes at the sediment-water interface in tidal freshwater zones of southern Texas rivers. Hengchen received his B.E. and M.S.E. in Environmental Engineering from South China University of Technology and Johns Hopkins University. He focuses on how water quality responds to nutrient input in the tidal freshwater zone of south Texas rivers. He joined the OFZ project as a Ph.D. student in 2015 and is advised by Dr. Jim McClelland. Nick received his B.S. in Marine and Freshwater Biology from the University of Texas at Austin. 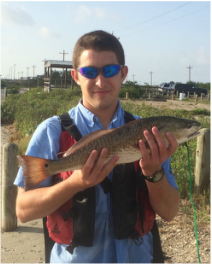 He is interested in characterizing organic matter flux in the Mission-Aransas National Estuarine Research Reserve as it relates to various water, nutrient, and climate parameters. He was in the Hardison lab from 2014-2016 while earning his Master's degree. He was co-advised by Dr. Zhanfei Liu. Nick is now working at the UTMSI in Dr. Ken Dunton's lab. Nathan earned his Ph.D. in Marine Science at the University of Texas Marine Science Institute in 2013 after receiving his B.S. in Biology from the University of Georgia in 2007. 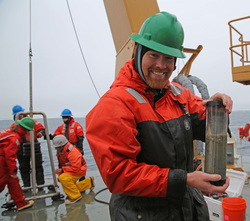 His research in the Hardison lab focuses on nitrogen biogeochemistry in sediments of the Chukchi Sea, off the north coast of Alaska. He was a postdoc in the Hardison lab from 2013-2014 and is now a postdoctoral researcher with the Currin lab at NOAA in Beaufort, North Carolina. Lizzy was a student in the 2018 Semester by the Sea program. 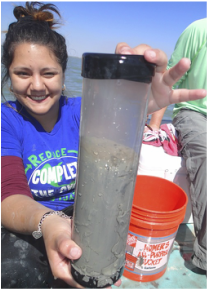 She worked on the NSF RAPID project, where she investigated the impact Hurricane Harvey had on phytoplankton communities in the Mission-Aransas Estuary. She will present her work at the 2018 GERS meeting in Galveston, TX. Spyder was a student in the 2017 Semester by the Sea program. 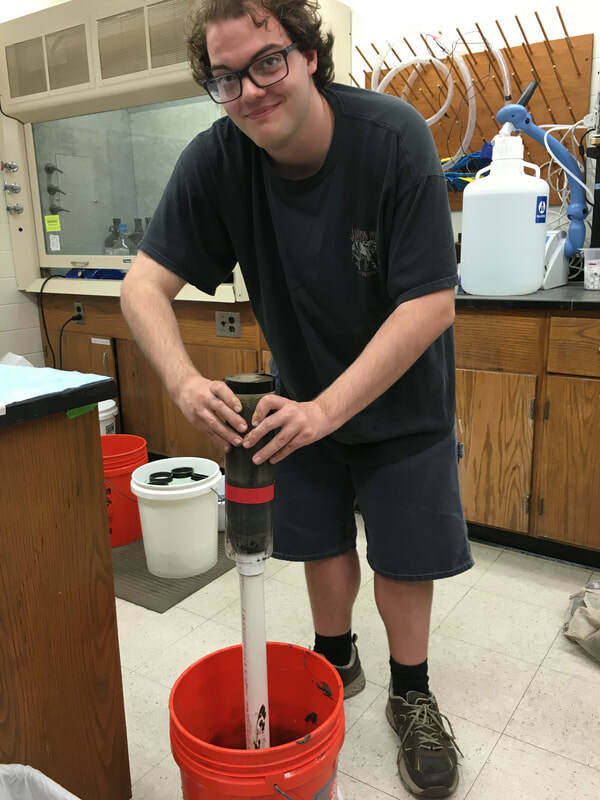 He worked on the OFZ project, where he added to previous undergraduate work focusing on sediment biogeochemistry. Ana and Grayson were 2016 REU student interns. They worked on the OFZ project in the Hardison and McClelland labs. They followed up on previous undergraduate work focusing on sediment respiration and physical characteristics in the OFZ. Kylie was a student in the 2016 Semester by the Sea program. She worked on the OFZ project, where she continued the work of REUs Tricia and Sierra from summer 2015 by measuring sediment respiration and physical characteristics in the winter. Tricia participated in the 2015 REU program. She worked in the Hardison and McClelland labs as part of the OFZ project. Tricia's research focused on organic matter respiration in OFZ sediments, and how it relates to physical characteristics of the sediments. She presented her work in a poster at the 2016 ASLO meeting in Santa Fe, NM. Sierra participated in the 2015 REU program. She conducted her independent research in the Hardison and McClelland labs as part of their Oscillic Freshwater Zone (OFZ) project. Her work focused on the physical characteristics of the sediments in the OFZ. Her work was presented in a poster at the 2016 ASLO meeting in Santa Fe, NM. Audrey participated in the 2014 Semester by the Sea program. She conducted her independent research in the Hardison lab, focusing on how sediment organic matter quality affects dissolved inorganic nitrogen dynamics in marine sediments. She worked on this project alongside undergraduate Veronica Aguilar, and both students earned travel funding to present their collaborative work at the Gulf Estuarine Research Society (GERS) meeting in Fall 2014. Veronica participated in the 2014 Semester by the Sea program. She conducted her independent research in the Hardison lab, focusing on how sediment organic matter quality affects N2 production and O2 consumption in marine sediments. She worked on this project alongside undergraduate Audrey Wohlrab, and both students earned travel funding to present their collaborative work at the Gulf Estuarine Research Society (GERS) meeting in Fall 2014. Shelby participated in the 2013 Semester by the Sea program. She conducted her independent research in the Hardison lab, focusing on the effects of wind mixing on nutrient dynamics in a shallow wastewater treatment pond. This project was in collaboration with Sylvia Garza, an undergraduate researcher in Dr. Wayne Gardner's lab. Both Shelby and Sylvia received travel funding to present their work at the Coastal and Estuarine Research Federation (CERF) meeting in Fall 2013.